A pumpkin pie recipe reminds me of the holiday season. Thanksgiving and Christmas in my family always includes a delicious pumpkin pie. Rich with cinnamon and ginger, I can almost smell it baking now. In a large bowl combine, pumpkin, vanilla extract, sugars, cloves, cinnamon, ginger, salt and eggs. Mix ingredients well by hand or with electric mixer. Set pumpkin mixture aside. In a small pot combine milk and cream, heat until almost boiling. Add to pumpkin mixture and mix thoroughly. Next, pour pumpkin mixture evenly into two unbaked pie shells. Bake on center oven racks for about 1 hour. Pies are done when wooden toothpick inserted into center of pies comes out clean. Cool before serving. You can serve your pumpkin pie warm or chilled. I prefer to serve mine chilled topped with whip cream. With most cooking, spicing is to your taste and can be adjusted to suit. If you don’t like cinnamon, use less and try adding a bit of nutmeg. I am not a cloves person, but the amount of cloves in this recipe is minimal and just adds a slight hint of taste. If you really don’t like cloves, leave it out. Pumpkin pie is easy to make and the bit of effort to make it from scratch is so worth it. Try it and you’ll see. It’s so good, this pumpkin pie recipe shouldn’t be saved just for the holidays. Plus pumpkin is SO healthy for us, we need to find ways to eat it more often. So eat pumpkin in as many ways and as often as you like. 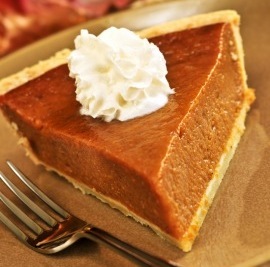 For more easy dessert recipes like this pumpkin pie recipe, look here.